We had a wonderful 6 days cycling in Provence. Neil designed great rides each day to match our ambitions that took in wonderful villages, great lunch spots and wonderful views (after a steady climb or few!). GPS system enabled us to enjoy the day and never get lost. Hospitality was perfect with good restaurant recommendations too. 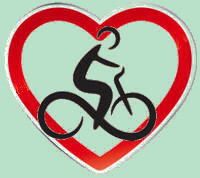 Neil and Nat's operation offers great food, great company, and great cycling routes. If you haven't used GPS before this will transform your cycling experience. As well as the rides that exist on the computer, Neil will create a tailor-made one for you in 5 minutes. This is a perfect location in the middle of beautiful medieval France. And by the way - really comfortable beds! If this is your choice of somewhere to stay you won't be disappointed. Nigel - UK - Oct 13. We thoroughly enjoyed our 6 night stay with Neil and Nat at Coustellet. The house is less than 10 minutes' walk from the village. We booked the ensuite bedroom (Oppede) which was very comfortable. Unusually for France, each bedroom has tea and coffee making facilities: Neil says he provided this on his Mum's instructions! There is a fridge full of goodies for guests with an honesty box. Dinner (every 2nd evening) and breakfast are taken at the table under the trellised vines. Both were very friendly times with great chat around the table and excellent food and drink. Neil does a terrific job in the kitchen. Their 2 young children add to the sense that you are friends invited to stay for a while. Best of all is the cycling set-up. Neil supplies the bikes, helmets and GPS system with a huge choice of rides in terms of length (14-80kms), difficulty and locations. Most of the time you will be on small side roads but even the occasional short stretch on a busier road does not feel stressful as French drivers are generally every respectful of cyclists. The area is full of beautiful villages and towns, all with a great choice of cafes and restaurants for lunch or for the evenings when dinner is not provided. Neil and Nat can advise on choice of restaurants and are also a fund of info about the area. We took Neil's advice and hired a car, which allowed us to travel into Avignon and to Mont Ventoux. Several car hire companies have outlets at the Avignon TGV station which is 40 minutes' drive from the house. Alan - UK - Sept 13. My husband and I are way overdue of reporting one of the most wonderful vacations we have had together at the beginning of August. We were celebrating 30 years together and could not have picked a better way. Ditto on all the previous positive posts. The only downside of our time was the heat (for me. my husband loved it). It was in the 90's the entire time. But then what can you expect for August. And it made the swimming pool that much more attractive upon our return! Had we had more will power, we could have made a picnic breakfast and left earlier. But the leisurely breakfast outside under the grapevines was just too alluring. 4) The bikes were great. However, I did take my bike seat as I am picky about this. If you have not ridden much lately, you might want to look for a comfortable seat and test it prior to the trip and then make room for it in your luggage. Two women who had not been on bikes had few uncomfortable days. 5) The advice from Neil as to which days are market days in the various villages and which restaurants are good etc. Thank you to Neil and Nat for an amazing time! Maureen - US - Aug 13. We just spent 6 days with Neil and Nat in Provence and all of us agree with everything that you read here. The routes were great, the gps was super, the discussions over dinner were wonderful and entertaining, the house was terrific, and oh yes--there were peaches off the trees in the yard, cherries from down the way and of course the lavender blooming. Really a great place for a small group as there are a variety of rides to fit fitness levels, moods, and you have both Neil and Nat's interest in the area and knowledge. If there were six stars this would be worthy! Belle - US - July 13. My wife Natalie and I along with four friends spent a fantastic week with Neil and Nat in Coustellet. The cycling was great, the ride options seemed endless and the bikes were spot on. The home cooked meals and local wines were a true highlight. Would recommend a cycling holiday with Neil to everyone. Robert - Australia - July 13. My partner and I enjoyed a magical six night stay at the Provence Farmhouse along with two other friends. Everything was amazing, from the organization of the rides, to the scrumptious meals, to our friendly hosts. I will definitely be recommending this to my friends and family, and hope to go back in the future. Provence is so gorgeous, and staying at the farmhouse, and cycling out for various day-trips is the best way to see it! 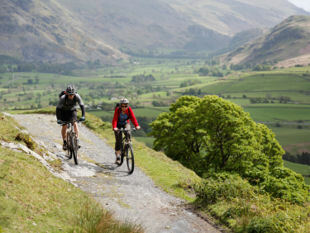 It's especially great if you're with a group, and different members want to enjoy different levels of cycling trips--and then reconnect at the house. Sarah - US - July 13. Rob - Australia - July 13. Self-Guided Cycling in Provence - Don't forget your shorts. As first time cyclists we knew nothing about organising a cycling holiday. We didn't need to worry as Neil took care of everything. Sorted out bikes for us; supplied lists of clothing to bring (definitely need cycling shorts!) and where to buy things if you didn't bring them (definitely need cycling shorts! ); helped us hire a car (to get the shorts). 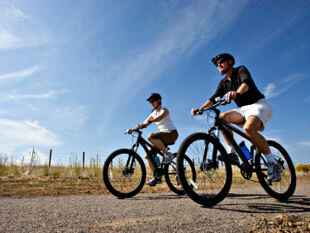 A huge selection of self-guided tours all pre-programmed into a GPS that attaches to your bike. Long to short, hard to easy routes, suggested restaurants and things to see along the way. Start and finish on any day of the week. The accommodation was very comfortable, the home-cooked dinners outstanding and the company sparkling. Neil and his wife Nat are fantastic hosts. Sarah - US - June 13. This was a dream vacation for my husband and I. We have wanted to explore Provence more and found this fabulous bed and breakfast with biking excursions that we could tailor to meet our abilities. The country side was beyond words and so peaceful. We loved all of the villages. Especially nice was coming back to the B&B to rest and have gourmet dinners 3 nights there. The other nights we were out in the area enjoying the lovely French restaurants. Neil and Nat were so nice as our hosts. Neil was excellent in helping us plan each day and giving us guidance of where to eat. And he served as the chef. Lucy and James are beautiful children we also enjoyed. Definitely worth our time! Deb - US - June 13. I started reading other reviews before writing this and said to myself, "what can I say that hasn't already been said a dozen times?" I can say that this is our second year in a row we've done this trip and stayed with Neil and Nat, and now more than ever look forward to our next time. (Index) Since actions speak louder than words that says it all. We're in love with Provence, we love seeing the countryside and villages from the closeness you get by being on a bike, and we adore Lucy and James. (The Cowell's young children) This is THE best bike experience you'll have bar none. Book early, they fill up! Peter - US - June 13. 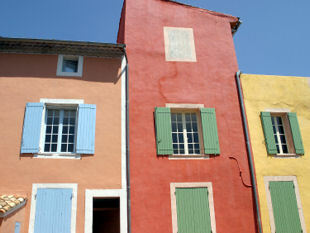 Memoires de Provence is ideally located in the midst of some of France's most beautiful villages. A beautiful and historical home itself, this B&B experience includes some of the best food and hospitality I've encountered thanks to owners Neil and Nat. I took good advantage of the cycling to see the region using a high quality and well equipped bicycle and easy to use GPS. My room had a French ambiance with a view of the pool and the arbored dining patio. There was lots of coffee, croissants, hot water for bathing, sunshine, food, wine and an easy going atmosphere. Top marks for this great Provence holiday destination. Colleen - Canada - June 13. Myself and my family recently sayed with Neil and his family for 10 days. We have varying cycling abilities and requirements but Neil was able to customise our routes daily to accommodate us all, all you have to do is follow the simple routes on the provided GPS. The accommodation is excellent and friendly with outstanding food provided every other day, this is by far and away the best way to see the gorgeous provence countryside. I have travelled a great deal and I can definitely recommend this experience to anyone interested in a holiday in beautiful surroundings staying in personal, friendly, relaxing accommodation. Harrison - UK - April 13.